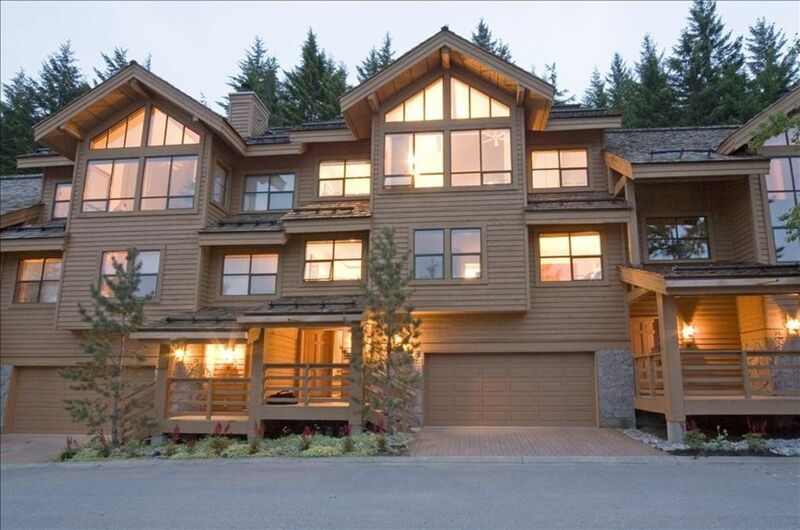 Luxurious townhouse situated in Whistler's Main Village just above the Westin Hotel. This townhouse has the best mountain view in a quiet exclusive development. It has open concept living space, with vaulted ceilings and bright rooms. This townhouse recently had a significant renovation to bring it up to the highest luxury ratings, and everything inside has been updated in a classic mountain chalet aesthetic. This property includes professional check-in and concierge services. Ski-in and walk-out trail (that includes stairs) or 8-10 min walk on road to lifts, golf course or shopping. 3 bathrooms +1 independent toilet with luxurious under floor heating. New designer gourmet kitchen with underfloor heating. Mud room with boot and glove dryers and beautiful etched glass door off front entry. Discounts on Ski passes available. There is a very private sundeck with a private hot tub. Free parking for up to 4 vehicles. Ground Level: A large entry, large closet with boot and glove heaters and equipment storage for 10 people, plus a locked, attached double garage with ski/snowboard/bike storage. First Level: Three bedrooms and two bathrooms. One of the bedrooms has a flat screen TV and can be used as a family room for the children or as a second TV lounge. Second Level: A living room with a large, flat screen TV, and dining room that have huge vaulting windows and ceilings and the best mountain view in the Northern Lights development (most of the units have trees blocking their views). There is also a full gourmet kitchen, den with a queen-size murphy bed and a single (twin) day bed, master bedroom (with another flat screen TV). All of these rooms have vaulting ceilings. There are also two more bathrooms, one of which has a jetted tub. Get ready for a highly luxurious and wholly relaxing experience while visiting this Northern Lights townhouse. Its magnificent view of the mountains will take your breath away. Before you head out on the slopes check out the 90 steps up to the ski-in, walk-out trail that takes you onto Whistler Mountain. This townhouse was fully renovated in the fall of 2008 to bring it up to the highest luxury ratings. The new kitchen is indeed a thing of beauty with its two-tone designer cherry cabinets, but will also satisfy the discerning gourmet cook with its gas stove and griddle, gleaming stainless steel appliances and granite work surfaces. If there is no gourmet cook among your group you can arrange to have one come in, or simply order in. Then sit down to dinner with the whole gang at the beautiful blue pearl granite table that seats 10 comfortably. Your toes will stay toasty warm with the new under-floor heating in every bathroom and the kitchen… or you can snuggle into the sumptuous, top-of-the-line mohair sofas with decadent fur cushions and watch your favorite program on a large, flat screen HD TV (with its own PVR system)… and there are two more HD TVs and DVD systems in the house in case everyone doesn’t want to watch your program! All the activities that the main Whistler Village has to offer are a very short walk away. This location can’t be beat because it is in the main Village where all the action is, but is secluded and nestled in the trees just above the chair lift and the Westin Hotel… truly the best of all that Whistler has to offer. And don’t ever worry again about putting your feet back into wet ski or hiking boots the next morning. The large walk-in closet/mud room has boot and glove dryers for 10 pair of each and ample storage space to hang all your outdoor gear. Skis, snowboards and mountain bikes are all securely stored in the locked, double garage. Once you’re down for the night you will be nestled in crisp, clean white sheets under a fluffy, hypoallergenic down duvet. Four bedrooms plus a den (with a comfortable, queen sized Murphy bed and a twin day bed) comfortably sleep 10. Eight beds in total. The master bedroom has a king-sized bed, the second bedroom has two extra long twin beds that, with the addition of a cushy topper, can be converted into another king-sized bed. The third bedroom has a queen-sized bed and the fourth bedroom has two twin beds (that can be linked together if you would rather get up close and personal with your roommate). To book this beautiful mountain view at Northern Lights in Whistler Village e-mail the owner. PLEASE NOTE that there is a scam on Kijiji and Craig's list by someone who is using our photos and information taken from our website. Everything was as described. Well equipped and extremely comfortable. Thank you! Very nice home. Close to everything. Great value. House was very nice and clean. Everything we needed was provided. The owner Cedric was very responsive to questions through the whole process. Very close to town and the village. Skiing in and out was quite a challenge, skiing out far more difficult than skiing in. You can walk to town, but taxis are readily available and affordable. We used taxis to get to and from town. House slept 8 comfortably. Great location nestled into the mountain allowing for great privacy, beautiful views and still minutes away from the Village. Thank you for your review Tracy, I'm glad you enjoyed the house. I'm heading there as we speak ;-)! I hope to have you back if you plan another trip to lovely Whistler. Very nice place with all the amenities and well kept. Lots of space and a nice place to hang out and unwind after a day of activities. Like the options that having a very nice, full stocked kitchen; would be a great alternative to going out for meals during a longer stay. Highly recommended and would definitely stay here again. Great place , nice views , all neat and tidy . All good even if you have to walk up the hill a bit, nice and quiet. Great view from upper rooms . Thanks for this nice review John, I apreciate it. Glad you had a great time, i hope to hear back from you in the future. Great house full of amenities, perfect location. We'll be back! This property rental includes professional check-in and concierge services. - Nightly rates quoted are for 7-night stays. The rates are lower for longer stays and higher for shorter stays. - A damage deposit is not collected at booking. A credit card imprint for a damage deposit will be taken and signed at check-in, but is not run through unless there is confirmed damage or excessive cleaning required. - Non refundable 25% deposit at time of booking. Balance due 40 days prior to arrival.